One of the seven Churches Together in Nantwich. 7.15 pm in the Parish Hall: Encounter Cafe Church (on the first and third Sundays of the month). A café-style service with a themed programme. Coffee available from 6.45pm. Rector: The Rev Dr Mark Hart. He was previously Rector of Plemstall and Guilden Sutton churches, and a former Rural Dean of Chester. Associate Minister: The Rev Professor Bernard Moss. The Curate, the Rev Kaushal David, moved to Bedfordshire to become Priest-in-charge of three parishes in the St Alban's diocese. The church is situated in the town centre and is open Monday to Saturday from 9am to 4pm. Stewards are on duty to welcome visitors and guided tours are available. Sundays, open during services only - 8am to 12.30pm and 5.30pm to 7pm. Parties can arrange a coach visit to the church. The Parish Office can be found in Church Walk which leads to St Mary's from The Square. Open Monday, Wednesday and Friday, 9am to 2pm; Tuesday and Thursday, 9am to 1pm. Telephone: 01270 625268. Rector's Surgery in the Parish Office on Saturdays at 9.30am or 10am, Book a time through the Parish Office (appointment only). This is a chance to talk to The Rector or another member of the parish staff or to book a date for a wedding, etc. The Visitors' Centre or Church Shop in the south porch is open from 10am to 2pm, Monday to Saturday. The south porch is one of two main entrances to the church. The West door is the other. Further information appears in the "This Week" leaflet or "This Month", the church magazine. Website: www.stmarysnantwich.org.uk. The church "re-ordering" included new inner glass doors at the west end of the church, the removal of some of the pews to make more open spaces (including a place for a grand piano in the south aisle), a platform lift to replace the wheelchair lift, stone ramps for wheelchairs (replacing the temporary wooden ones), toilets and a new door for the choir vestry. The Jubilee Curtain, marking the 25th anniversary of the reign of Queen Elizabeth II in 1977, and the pew kneelers were removed during the re-ordering so that dust from the work wouldn't affect them. Pew seat cushions were added. A location on the Two Saints' Way (walking route). BELL ringing is an activity that can be learned and enjoyed by people of all ages from around 11 until well into their 80s. To find out more about the benefits of ringing, particularly for youngsters, get in touch with me at St. Mary’s. Seniors’ Lounge. Second Sunday of the month, 3pm to 4pm, in the Parish Hall. A chance to enjoy friendly company and a chat over a cup of tea or coffee and cake with a varied programme of activities and a short talk. Messy Church. 3.30pm to 5pm in the Parish Hall, Suitable for families with children aged 11 years and under. Games, craft, Bible stories, worship, messy play and refreshments. For more information, including dates of the events, contact the Parish Office. Who Let the Dads Out? Second Saturday of the month, 9.30am to 11am, in the Parish Hall. For dads, grandads and other male carers, with their pre-school children. £1.50 per family, which includes drink, biscuits and a bacon butty. Open House. Held in the Parish Hall (opposite the Church) on one Wednesday a month between 2pm and 4pm, with an invitation for people to drop in for tea and a chat. A kneeler in the North Transept marking the visit of the newly appointed Rt Rev Libby Lane, Bishop of Stockport, to conduct a Confirmation service in 2016. She was the first female bishop to be consecrated by the Church of England. She will be installed as Bishop of Derby after Easter. Sunday: 10.30am, Worship. 10.30am, Sunday Club for young people aged four to 13. First Sunday of the month: 6pm, Cafe Church - a different style of worship, led by invited preachers. Friendly discussions, chat, videos, singing, and spirit-led worship over refreshments. Contact Jackie Holland (624914). Fourth Thursday of the month: 11.30am, Communion. Communion (11.30am) and Lunch (12.15pm), on the fourth Sunday of the month. Thursday (9.30am): Prayer Meeting. Contact Brenda Bowers (01270) 623794. For other services and activities, see the website or call in to the Church Centre for various information leaflets. Also the quarterly magazine, "On Track" (see below). The Rev Charlotte Lorimer (telephone: 01270 618872). E-mail: clorimer826@btinternet.com. The Rev Malcolm G. Lorimer retired from active ministry after 40 years' service. Telephone: 01270 625278. E-mail: maxcricket@btinternet.com. Nantwich Mission Area: Nantwich, Barbridge, Broad Lane and Poole. On Track is the name of the quarterly magazine published by the Nantwich Methodist Mission Area. It is based on the Hospital Street church's slogan, "The Church with the Train." (See Poole Methodist Church entry for details of a community garden and labyrinth). Model steam train rides at the side of the church, every Saturday from 10am to 12 noon (52 Saturdays a year). The rides are free for all ages but a donation for four children's charities is welcome. Families Fund and Cheshire South Methodist Circuit. Drop 'n' Shop, between 10 am and 12 noon on Saturday mornings. A club for children aged 4 to 11. For a maximum of one and a half hours parents can leave their children at the Methodist Schoolrooms to be entertained by church members while they shop. Climbing wall, Wii, air hockey, snooker, craft table and more. All volunteers are CRB checked. £1 per morning including light refreshments. Contact: Heather Durant on 626168. Pizza Club, on the first and third Saturdays, 6pm to 8.30pm. DVD and games evenings for youngsters aged 11 and over. All volunteers are CRB checked. Contact: David on 627170. Sunday Club, every Sunday at 10.30am. Contact: David on 627170. Wesley Guild, 7.30pm on the second Tuesday of the month. Contact Pat Maidment (01270) 627170. Men's Club, 7pm on the second Wednesday of the month at the Vine pub in Hospital Street for a drink and a chat. All welcome. Contact the Rev Malcolm Lorimer on (01270) 625278. Totstop. Wednesdays in school term time, 1.30pm to 3pm. For children up to the age of four. Contact: Liz on 663972. Soup+More on the first Saturday of every month, 12 noon to 2pm. Coffee mornings are held on Thursdays and Saturdays, 10am to 12 noon. Women's Fellowship, 2.30pm to 3.30pm on the second Thursday of the month. Contact Barbara Barker (01270) 624363.
l READ about The Church with the Train here. 10.30am: Morning service with Junior Church and creche. 6pm: Evening service (Communion service 1st Sunday). Minister: the Rev Garry Wareham (01270 627261). A Christian youth group for teenagers in Nantwich, meeting at Market Street Church. Deacon: the Rev Peter Mascarenhas. 2.15pm: Weekly worship (November to February). First Sunday of the month, 2.15pm: Sankey Gospel Service. 6.30pm: Evening service (March to October). Minister: the Rev Charlotte Lorimer. The church is in the Nantwich Mission Area and the Cheshire South Methodist District. Coffee Club, every Monday at 10am. Contact Mike Docker (619855). House Group, Tuesday, fortnightly, at 3.15pm. Contact Patti Wilson (569293). Sisters in Stitches, Wednesdays at 10am. Contact Daphne Mounteney (811242). The Chapel, Regents Park, 129 London Road, CW5 6LW. Telephone: 626749. 10.30am: Celebration service in the Chapel. 10.30am: Youth Church. The two events combine at 11.30am. See website for other activities and information, and Facebook. See this page for events at Regent's Park. Regents Theological College has moved to Malvern. A group of seven churches in the Nantwich area - the six above and St Mary's Parish Church, Acton, below. Nantwich Street Pastors have volunteers from the six churches in town. They are on patrol from 11pm until 3.30am on some Tuesday (student night at the clubs), Friday and Saturday nights. They are supported by at least two Prayer Pastors at their base. They are trained volunteers "who care about their community" and are on hand to help young people in the town centre. The Vicar: The Rev Anne Lawson. St Mary's, Monks Lane, Acton, CW5 8LE. 01270 628864. St Bartholomew's, Cross Lane, Church Minshull, CW5 6DY. St David's, Long Lane, Wettenhall, CW7 4DN. Officiating Priest, the Rev Keith Hine, 01829 732491. St Oswald's, Church Road, Worleston, CW5 6DR. Associate Minister, the Rev John E. Varty, 01270 877360. Tea in the Tower is held every Sunday afternoon (2.30pm to 4.30pm) in a community cafe at St Mary's Church, Acton. A chance to have a chat and enjoy tea and cakes. There is no set charge, but voluntary donations are welcome. Well-behaved dogs are also catered for (a bowl of water is available!). And there are guided trips up the church tower - as far as the bell ringing chamber - for the energetic. Contacts: Stephan Davies (07731 800663) or Deana Emerton (01270 624889). TWO-HOUR (approximately) walks from St Mary's, Acton, on Sundays at 1pm. Leaflets are available. Back in time for tea. Telephone Stephan Davies (01270 624135) to reserve a place on a walk. Or e-mail stephan.davies1@talktalk,net. All welcome. There is no charge but donations will be gratefully received. Vicar: the Rev Canon Helen Chantry (Rural Dean). 01270 811543. Curate: the Rev Rachael Griffiths. 07568 264229. The church is running a Church Fabric Fund appeal for substantial repairs to the church, particularly the tower. Main Road, Wybunbury, Nantwich, CW5 7LS. Three congregations of Anglican Churches in South Cheshire - St Margaret's, Wrenbury; St Michael's, Baddiley; and St Mary and St Michael's, Burleydam. o Vicar: the Rev Alison Fulford. The Vicarage, Wrenbury, Nantwich, CW5 8EY. Telephone: 01270 780742. A grouping of 37 churches, Cheshire South Methodist Circuit is part of the Chester and Stoke-on-Trent Methodist District. See the website for details of services at the various churches, together with information about the churches. Nantwich: Nantwich, Barbridge, Poole, Broad Lane. Wrenbury: Baddiley and Ravensmoor. Broomhall and Sound. Lightwood Green. Services: Sundays 10.30am. 1st Sunday of the month, Holy Communion. Wrenbury Road, Aston, CW5 8DQ. Sunday service: Each week at 11am. See the Cheshire South Methodist District website for details of services, together with information about the church. Swanley Lane, Ravensmoor, Nantwich, CW5 8PX. Sunday services: 10.30am, first, third and fifth Sundays of the month. Newtown Road, Sound, CW5 8SG. Sunday services: 10.30am, second and fourth Sundays of the month. The church is in the Nantwich Mission Area and the Cheshire South Methodist District. It is the oldest church in the Circuit. 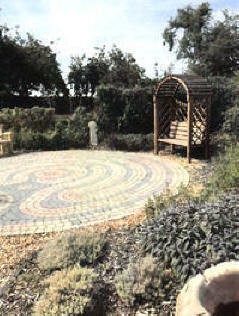 A COMMUNITY quiet open garden and labyrinth at the rear of the chapel is open seven days a week all the year round. It was the idea of the Society of Friends, or Quakers, who used to meet at Poole but now meet at Coppenhall Methodist Centre, Bradfield Road, Crewe. More than £10,000 was raised to complete the garden, from the Cheshire South Methodist Circuit, Cheshire East Council, fund-raising events and individuals. A leaflet on the garden is available at Poole and Nantwich Methodist churches, and the opening of the garden, in September 2016, was reported in the Autumn 2016 edition of the circuit's magazine, "On Track" (based on the Nantwich church's slogan "The Church with the Train"). The picture of the garden is taken from that edition of the quarterly magazine.